Some artists hate them, but I like doing backgrounds. Sometimes they are the most fun you can have on a page. And sometimes they are the most boring and tedious thing on the page. But I still like doing them. I worked on the MISTER X series from Caliber in the late 90s. Following artists like the Hernandez Bros., Seth, and Paul Rivoche was a bit daunting. 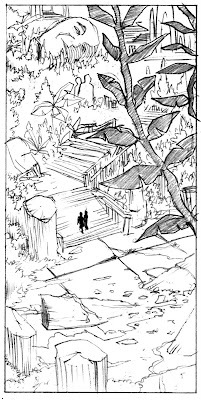 But it was on that series that I really got into backgrounds and environments. My approach to the art on that series was a mix of the Hernandez Bros (the characters) meets Paul Rivoche (the city). 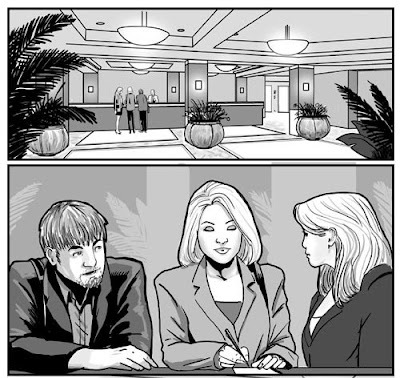 Today I worked on another panel of PERILS ON PLANET X. Below is the penciled image. A lost city in a jungle for our heroes to wander in. When I started getting this ready to post I thought I would share a few more examples of background work. There are a few different styles to this as well. 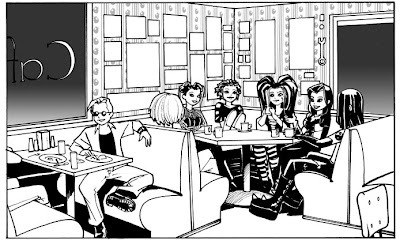 The panel below is also from POPX. A hanger/service bay for ships on the floating city. Lots of platforms and hanging equipment. The area has seen better days and some things just don't even work anymore. Below is from BEGOTHS COMICS #2. A series of two books based on a line of collectable goth dolls. A gathering at a coffee shop. You can almost feel the sticky vinyl booths. I did this series with gray tones and added extra touches like the wallpaper. The next three panels are from McCANDLESS & COMPANY, by JC Vaughn and art by me. 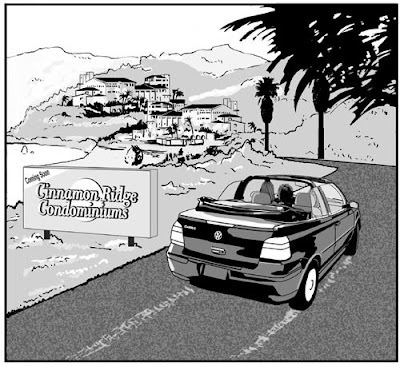 (Look for it from Moonstone in the next Previews) Our cast is checking into a five star hotel in the Bahamas in the early hours after midnight. Note the emptiness of the expansive lobby. 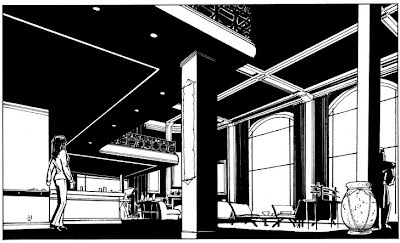 Catherine returns to her penthouse in DIARY OF NIGHT #1 , by Will Allred and me. Catherine is over 400 years old and while she may have collected a lot in her lifetime, I went with a less is more look to her place. Big open room with big windows to let in plenty of sunshine. Oops. No, that really was part of the design. The kitchen is to her left and looks out into a sitting area, a living room area with fireplace and a view to kill for. Her bedroom is upstairs and her library is on the other side of the kitchen. The doors in her home come from an old convent in France. A few different approaches and styles to make the page a bit more interesting and to help tell the story.